Taking on the streets. East or Westside. Uptown and Down. The pace quickens through the boroughs from necessity. Every move the most important. Too much competition. Looking at each other for someone to blame. Doing anything just to be part of the magnitude. Everybody lost in the expanse. The City doesn’t cheat you. It teaches. You absorb either knowledge or the blows. There are days when you find out you can’t cut it anymore. And there are others when you come out at the top. 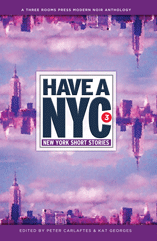 The Have A NYC anthology series is an intense annual collection of modern short stories set in New York, edited by Peter Carlaftes and Kat Georges. Authors include acclaimed crime writer Lawrence Block (Eight Million Ways to Die, Hit Me), neo-surrealists Janet Hamill and Rae Bryant, and Evergreen Review editor Ron Kolm. Other authors include Jeb Gleason-Allured, Sion Dayson, Kofi Forson, Resa Alboher, L. Shapley Bassen, Michael Schwartz, Puma Perl, Thomas Pryor, Jackie Sheeler, Peter Marra, Maria Kranidis, Richard Vetere and Eric Stromsvold. Editors Peter Carlaftes and Kat Georges are co-directors of Three Rooms Press. Day or night. Rain, heat or snow. The city streets are full of people seeking the path to a better life. Everybody learns the hard way. Some not soon enough. And even dreams must pay their dues. That’s just the nature of The City. That’s New York. 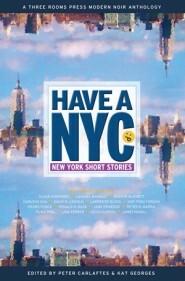 Welcome to Have a NYC< (Three Rooms Press, ISBN 978-0-985813-3-8, 2012, 162 pages), the first of a New York short stories series, edited by Peter Carlaftes and Kat Georges. In Have a NYC, Three Rooms Press aims to acknowlege that the energy that drives New York is still there, and not just in “hipster” neighborhoods or well-trodden streets. The stories are forming and reforming moment by moment. Drifters pass through and lend their ideas; natives look to cling to the things they see are ebbing away; the underbelly still writhes and reels to an urban beat; and the familiar landmarks take on new looks and menace as technology slowly grips the throngs of people walking the New York City streets. Authors include: Claus Ankersen, Larissa Shmailo, Adam R. Burnett, Darlene Cah, David R. Lincoln, Lawrence Block, Kofi Fosu Forson, Pedro Ponce, Ronald H. Bass, Jane Ormerod, Peter D. Marra, Puma Perl, Lisa Ferber, Keven Dupzyk and Janet Hamill.